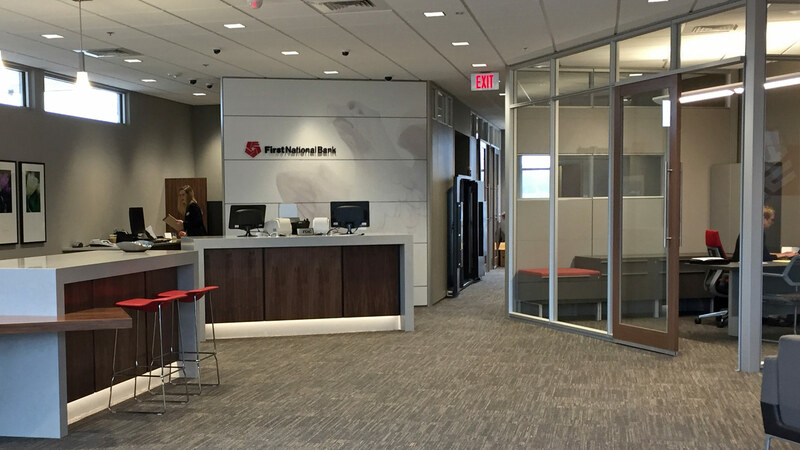 The First National Bank in Sioux Falls opted to test a high-traffic location as a tenant in a newly constructed strip mall. 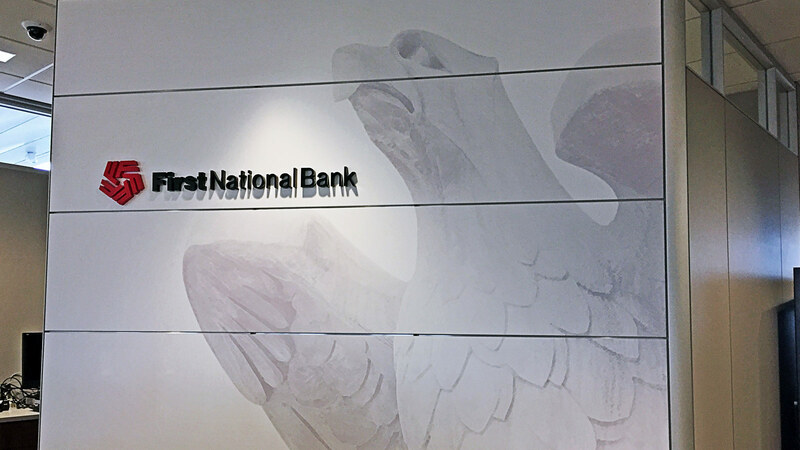 The branch’s bold shapes, signature red, and backlit pylon sign with illuminated logo all work together to ensure FNBSF stands out from the rest of the offerings. 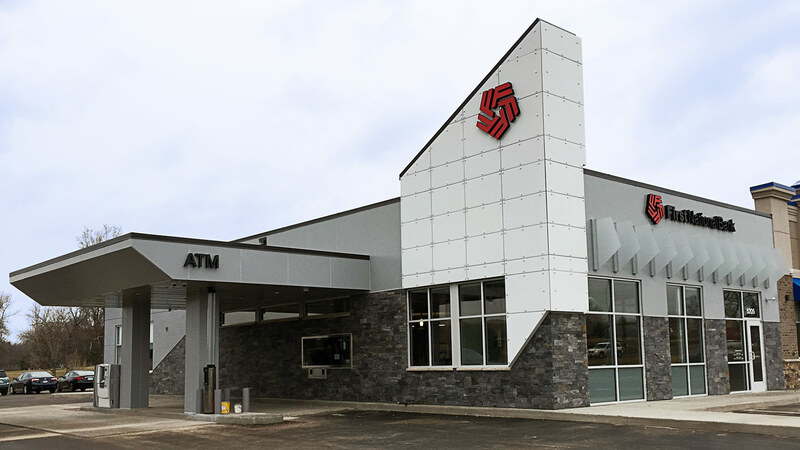 Exterior stone and prefinished metal architectural panels complete the look. Data from the family-owned bank indicates a rapidly expanding base of younger customers. 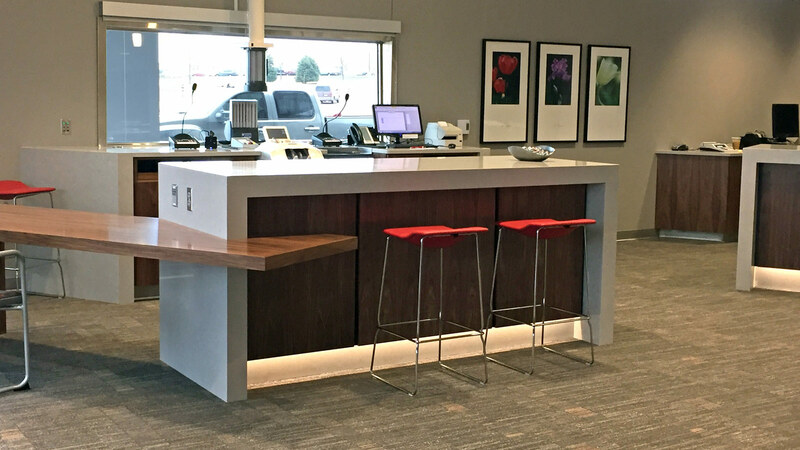 To meet their needs, the Arrowhead Branch moved away from the traditional teller line with a design that features teller pods and a freestanding countertop or kiosk. Customers and tellers no longer are separated by a counter but side-by-side can view the same screen and conduct banking services. Cash recyclers, which serve as “mini-ATM safes,” offer a safety feature that allows the teller to deposit or withdraw money. No one else has access to the cash, however, nor is there a vault for cash and safety-deposit boxes. Instead, freestanding safes can hold the safety-deposit boxes. Another modern innovation: The branch was designed with flexibility to allow furnishings to be moved easily as staff expands or duties change. 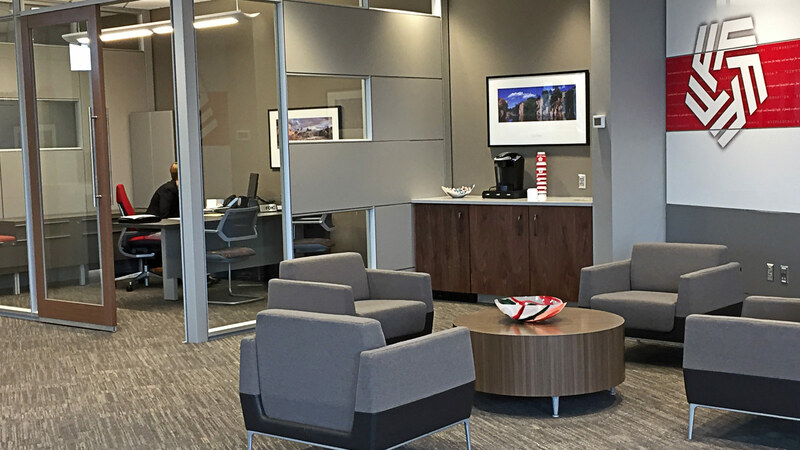 To create offices, TSP’s in-house interior designer chose a DIRTT modular wall system with glass partitions. The walls function to expand or contract office space as the bank’s needs dictate, with little to no down time during the changeover. As an added bonus, the glass partitions allow plenty of daylight to enter interior spaces, creating an open and airy feel within a relatively small footprint.